This intense, moving-head beam packs a powerful 140-watt light discharge engine under the hood, delivering brilliant, sharp beams of light for a spectacular effect. The Intimidator Beam 140SR features a motorized frost filter which converts the tight beam to a wide wash for different applications. 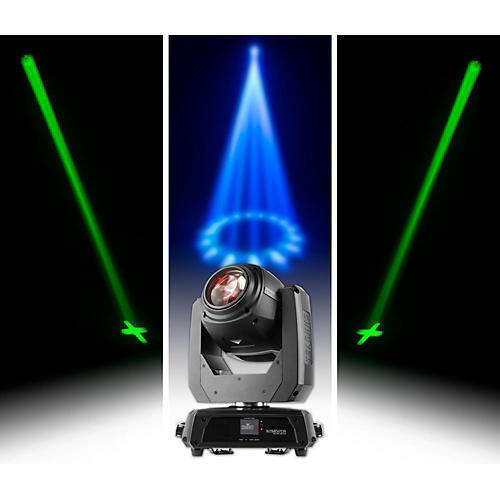 An impressive 16-facet prism splits the beam and intensifies the display for a dynamic, exciting lighting show. The built-in totem mode keeps the light on and over the dance floor. On-board power linking saves time running extension cords while a unique ¼-turn hanging bracket allows for single- or dual-clamp mounting options.